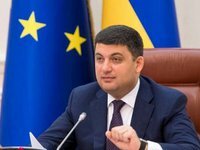 The Cabinet of Ministers of Ukraine at a meeting on Thursday approved the strategy for information reintegration of Donetsk and Luhansk regions. According to an Interfax-Ukraine reporter, it is expected that the implementation of the strategy will help create a unified system for coordinating the state policy of information reintegration of these regions. In addition, the strategy is aimed at forming an understanding and support in residents of occupied territories that they belong to the economic, political and cultural space of Ukraine. The objectives of the strategy are realizing information human rights and freedoms, increasing citizens' support for state policy in the field of information reintegration, and creating mechanisms for ensuring the access of Ukrainian citizens who live in the occupied territory to the all-Ukrainian information space. The implementation of the strategy will be financed from the state budget, local budgets and within international technical assistance. In addition, the Cabinet of Ministers instructed the Ministry of Information Policy and interested bodies to prepare and submit to the government a draft of measures for the implementation of the strategy.